This past April, I participated in Camp NaNoWriMo, an online writing challenge to set and meet a monthly writing word count goal with the support and encouragement of some fellow “campers.” My group — or “cabin” — of writers included several fascinating people and talented writers I’m now happy to call my friends. One of my cabin-mates, Christie Cote, has just published her first novel. Christie was gracious enough to speak with Earn This to tell us a little bit about her book and her aspirations as an author. 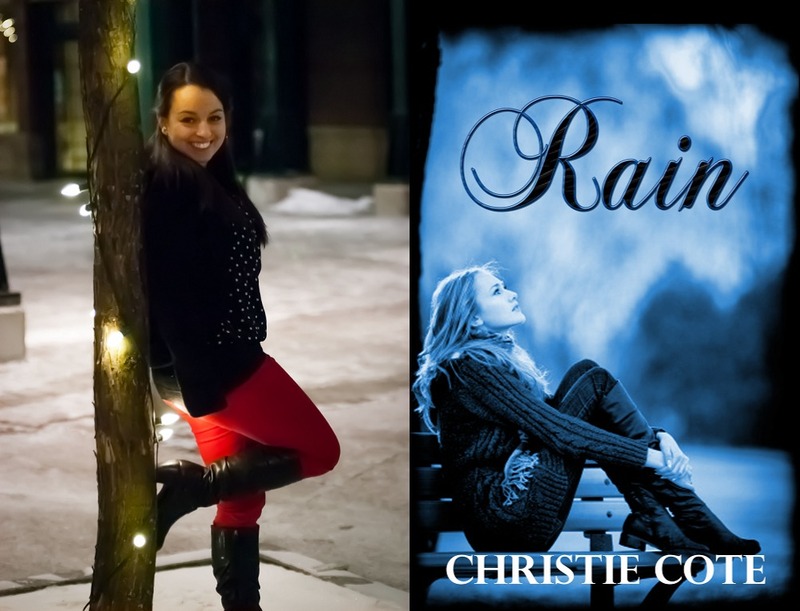 Her book, Rain, is now available on Amazon. Hello, Christie! It was great to meet you over at CampNaNoWriMo this past month. Can you tell us a little bit about yourself and your background? Hi Dan! It was wonderful meeting you at CampNaNoWriMo, as well! I’m twenty five and don’t find myself at all interesting. I’m working on finishing my bachelor’s degree in Communication and have taken a wide range of classes along the way. I’m an avid reader and have been a book blogger for a few years now. I like to play soccer and took up archery last year, as well. I hate to cook, but love to bake. Rain is your first novel. What was the writing process like? I saw the beginning image in my head and just started writing. I didn’t really plan or outline, just kept writing. There were a few scenes that jumped into my mind and I wrote them ahead of time, but other than those few scenes I just wrote from start to finish. What genre would you categorize Rain under? I would categorize Rain as Young Adult/Teen, Realistic Fiction/Contemporary Fiction. Who are some of your favorite authors? Who are your creative inspirations? I have a lot of favorite authors! Some of them are: Colleen Hoover, J.K. Rowling, Patricia Briggs, John Connolly, Jennifer Armentrout, Lurlene McDaniel, Tammara Webber, Cassandra Clare, Michelle Sagara, Jolene Perry, and Maria Snyder. How long have you been writing? When did you know that you wanted to be an author? I believe I have been writing since around eighth grade. I’ve known I have wanted to be an author since my freshman year of high school, which was in 2005. Your “Books” page lists several upcoming projects. What’s on the horizon for your writing career? I wrote Breaking Pointe, a New Adult novel during last November’s National Novel Writing Month. I plan to edit that and publish it in the future. I’m also going to start writing the next book in the Rain series, Before the Rain, which is in another character’s point of view. There will be one more book in the series after that, Through the Rain, which will be in two of the character’s points of views. I eventually want to get back to writing Blood Red Sky, which is what I had attempted to work on in Camp NaNoWriMo, but my head was too wrapped up in the Rain world along with everything I had to get done for the release date of Rain. All of that should keep me busy for a while, but I do have another story idea once I tackle those projects. Thanks for taking the time to share with us. Is there anything else you want to tell us about your writing? You are very welcome, I’m just happy to be on your website! Kyle Thorne was a stranger, harboring secrets every waking moment, haunted by them every time his guard was down. He moved in with his dad in the hope of escaping his dark past. That proved to be difficult when a piece of that past showed up at his front door, jeopardizing his new beginning and his relationship with Taylor—the one person who made him want to expose all of his secrets. Fans of Rain will love this addition because they will get better understanding of Kyle and learn his story. The entire series can be added on Goodreads! Thank you so much for hosting me on your website Dan! The interview was a lot of fun and it was really great meeting you during CampNaNoWriMo! I hope we can participate in another event together, especially when I actually have time to write! We had a pretty great cabin, I’m sad I didn’t get to participate as much as I had wanted. Thanks for taking the time to speak with us! I hope your novel is doing well, and I hope our paths cross again soon. Cheers!